Walk with the Apache Tribe of Oklahoma Violence-Free Living Program in honor of Sexual Assault Awareness and Prevention Month. The walk will begin at 10 AM at the Apache Tribe of Oklahoma. The Absentee-Shawnee Tribe Domestic Violence and Family Services invites you to attend this candlelight event in honor of Sexual Assault Awareness Month. 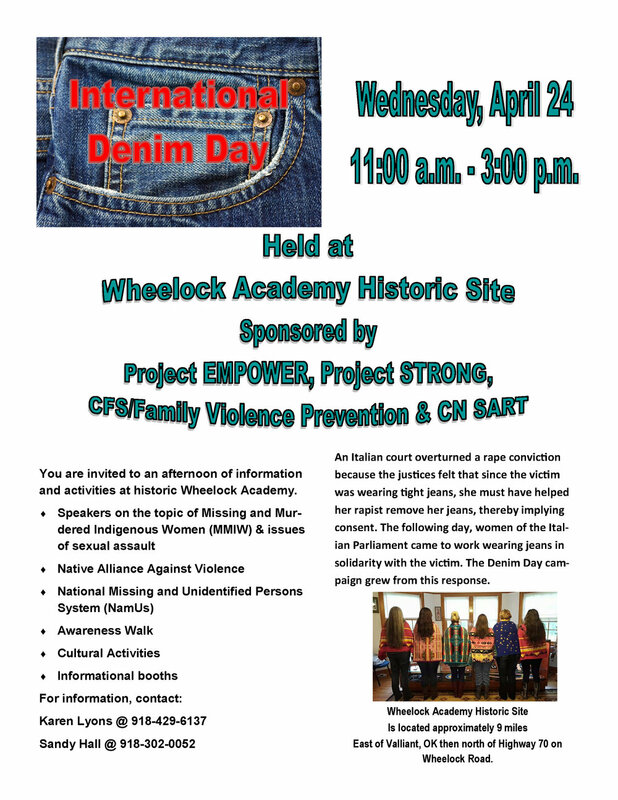 The Choctaw Nation of Oklahoma Family Services/Family Violence Prevention is collaborating to bring an awareness event for International Denim Day. There will be speakers on the topic of Missing and Murdered Indigenous Women (MMIW), speaker from the NAAV, NAMUS, a Sexual Assault Awareness Month awareness walk, cultural activities, and more! Join the Cheyenne and Arapaho Tribes Domestic Violence Program as they host several events for Sexual Assault Awareness Month. Balloon launch and meal to follow. 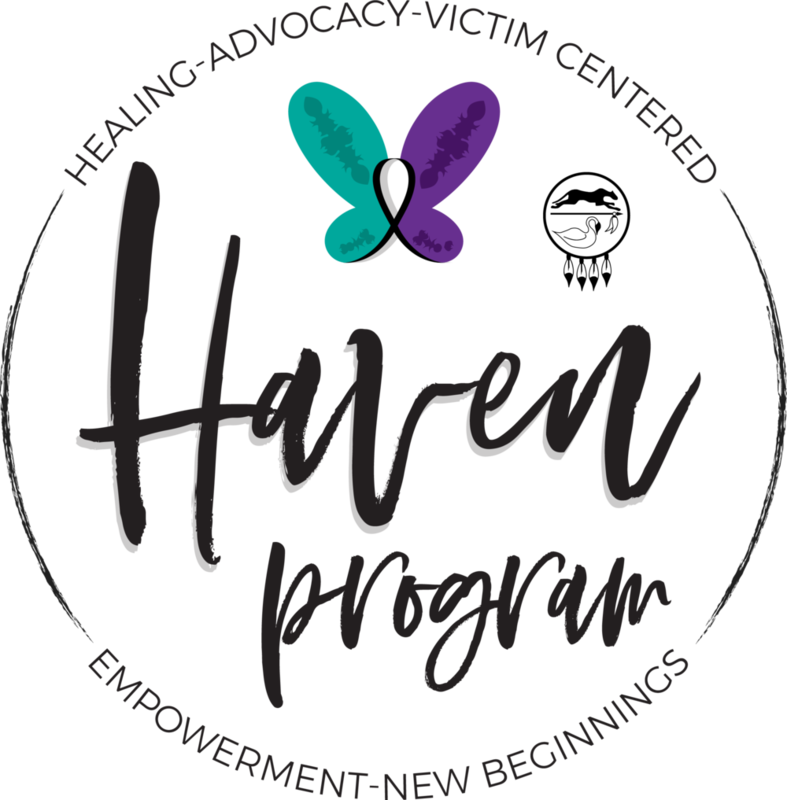 The HAVEN Program will be hosting an open house at their new facility located at 10200 S. 695 Rd Wyandotte, Ok from 2-6pm. They will be talking about the program, and presenting our clothesline project that displays the impact of Sexual Assault on our community. Please feel free to drop in at anytime between 2pm - 6pm to tour and visit with them. 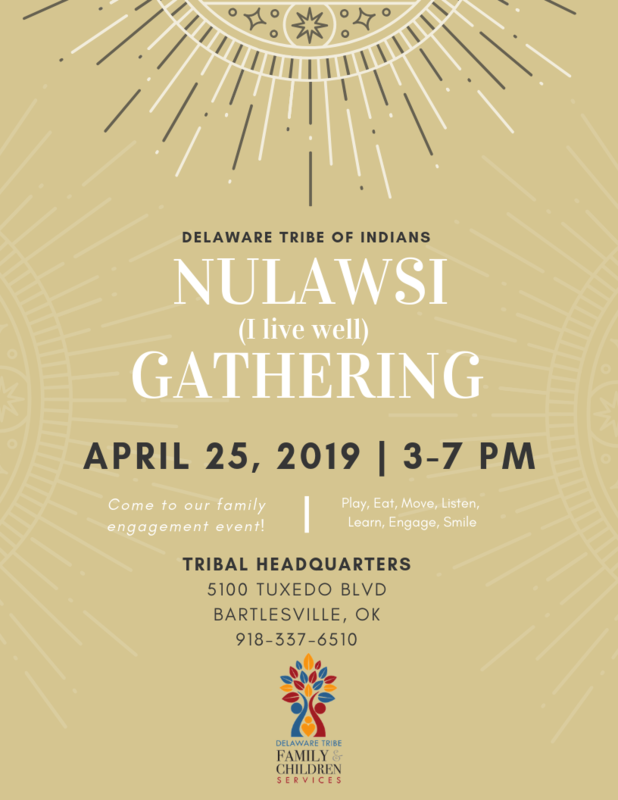 The Delaware Tribe of Indians Family & Children Services is hosting the Nulawsi (I live well) Gathering on April 25th. This is an event you can bring your whole family to play and learn about living well. This cultural activity is held for survivors of domestic and sexual violence. *Workshop is full* but you may call 918-732-7979 to ask to be placed on the wait list. 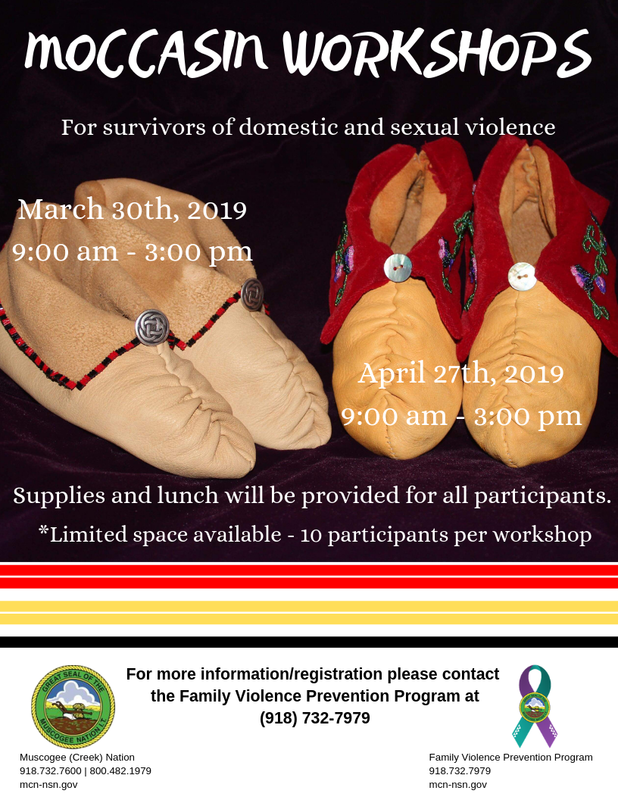 Join the Cheyenne and Arapaho Tribes Domestic Violence Program as they host several events for Sexual Assault Awareness Month. This event will be a sweat ceremony. The Pawnee Nation Ti-Hirasa Domestic and Sexual Assault Healing Center invites you to attend a free screening of the movie ‘Wind River’. There will be a special speaker, Mee-Kai Clark, free hotdogs, popcorn, and nachos. Bring your blanket or chair. AGE LIMIT:16 years & older for Rated R film. This will be the NAAV’s 2nd annual awareness event on the topic of missing and murdered Indigenous women. The event will be hosted by the Otoe Missouria Tribe at the 7 Clans Casino in Red Rock. The Comanche Nation Family Violence Prevention Program, along with other Comanche Nation programs, is hosting a free Women’s Wellness Seminar on May 9th. There will be a free continental breakfast and lunch provided. There will also be free health screenings, motivational speakers, and much more. You are invited to the annual ITO Easter egg hunt this Saturday. The event is completely FREE. We will have a “Color me Fearless” color run for sexual assault/child abuse awareness month, food, and an egg hunt for all ages (even adults!!). The NAAV will be attending this event and will have a doggy photo booth set up! 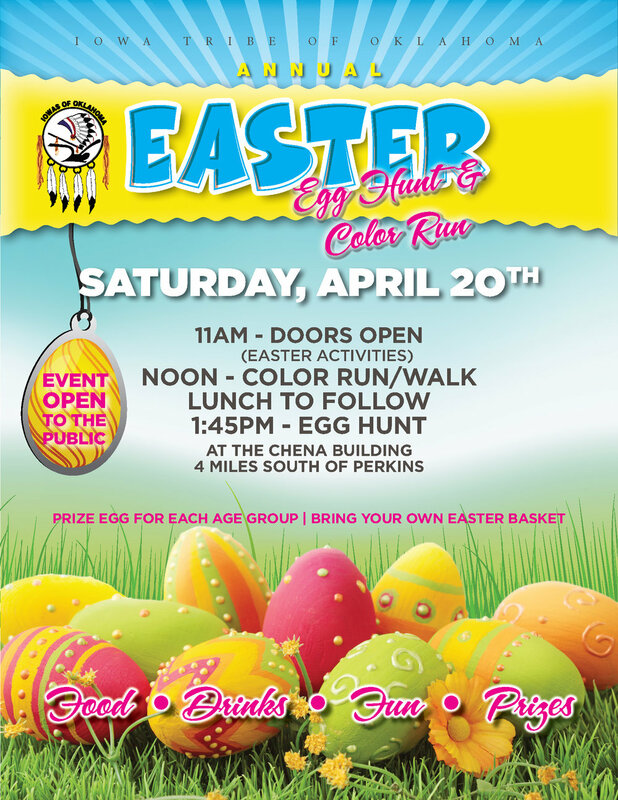 The Kiowa Tribe Domestic Family Violence Program is co-hosting this super fun Easter Egg Hunt. There will be face paint, food, prizes, and a bounce house, so bring your whole family for fun. In honor of Sexual Assault Awareness Month, the Native Alliance Against Violence invites you to attend the 5th Annual Gathering of Voices: Addressing Sexual Assault in Indian Country. The event will take place at Green Country Vo-Tech, 1100 OK-56 Loop, Okmulgee, OK 74447, April 18, 2019 from 1 p.m.-3:30 p.m. This year’s theme is “Standing up. Speaking out. Taking action.” The NAAV seeks to bring attention to the unspoken struggles of Oklahoma’s American Indian women that have been affected by sexual assault. The event also aims at educating the community on how to respond to and acknowledge societal norms that promote violence against women. “We want everyone to feel confident in knowing that they can take action to prevent and eradicate sexual violence. Native women are 2.5 times more likely to experience sexual assaults than other races, so it is important to demonstrate to survivors that there are steps being taken to stop the cycle of violence”, said Dawn Stover, Executive Director of the Native Alliance Against Violence. The 5th Annual Gathering of Voices: Addressing Sexual Assault in Indian Country will be hosted by the Muscogee (Creek) Nation Family Violence Prevention Program and is free and open to the public. The keynote speaker, Olga Trujillo, is an internationally renowned speaker and author that has devoted her career to helping others understand the impact of trauma on survivors of abuse. She will be sharing her own personal story of survival and how she was able to overcome and heal from the trauma she endured. “We are encouraging survivors of sexual violence to recognize that there are many of us who are willing to stand up, speak out, and take action against sexual assault. You are not alone in the fight”, said Stover. Join the Cheyenne and Arapaho Tribes Domestic Violence Program as they host several events for Sexual Assault Awareness Month. Light refreshments will be served. 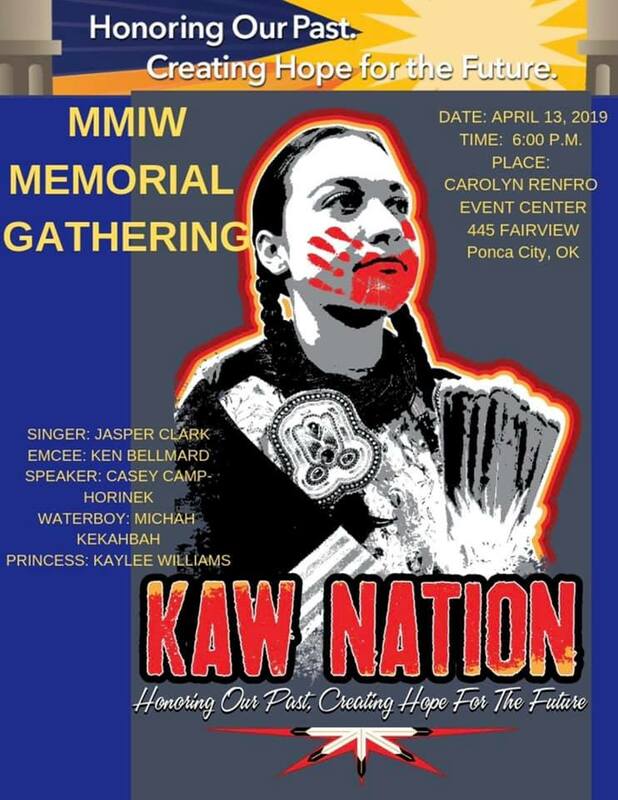 The Kaw Nation Family Trauma Healing Center is honoring Crime Victim’s Rights Week by holding a Missing and Murdered Indigenous Women (MMIW) Memorial Gathering. 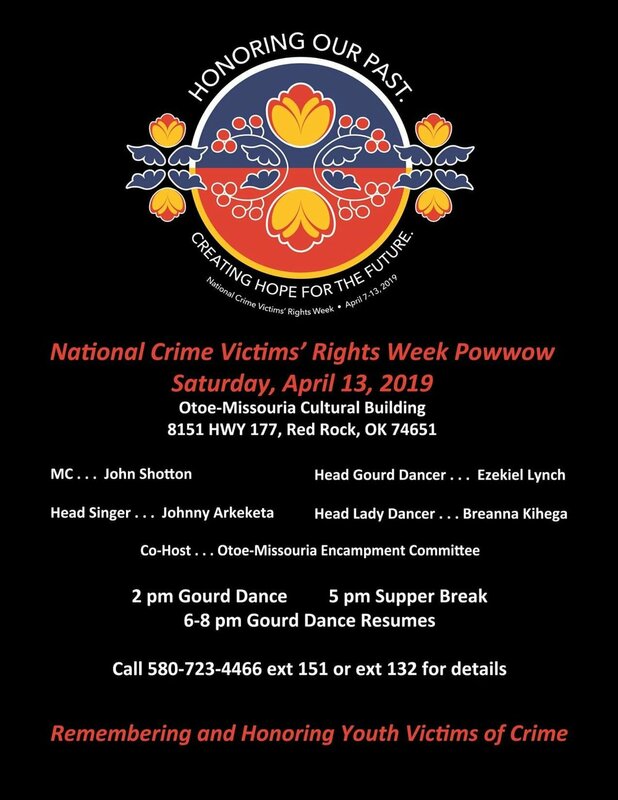 The Otoe-Missouria Tribe of Indians Oklahoma Social Services is hosting the National Crime Victim’s Rights Week Powwow to remember and honor youth victims of crime. 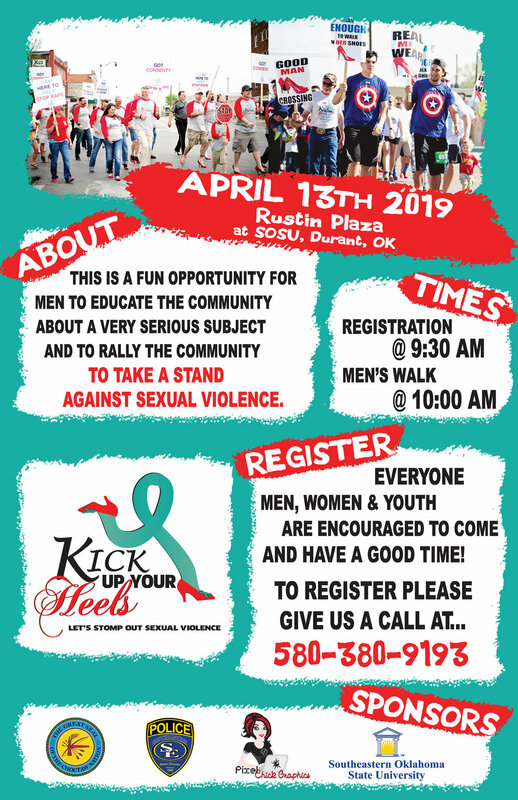 The Chickasaw Nation Violence Prevention Services is hosting “Walking to Stomp Out Sexual Assault” in honor of Sexual Assault Awareness Month. There will be free t-shirts, food, and drinks. The Otoe-Missouria Social Services program is hosting a walk to honor all victims of crime. There will be tote bags and Pendleton door prizes while supplies last. There will also be an MMIW art display by Frontier Students. 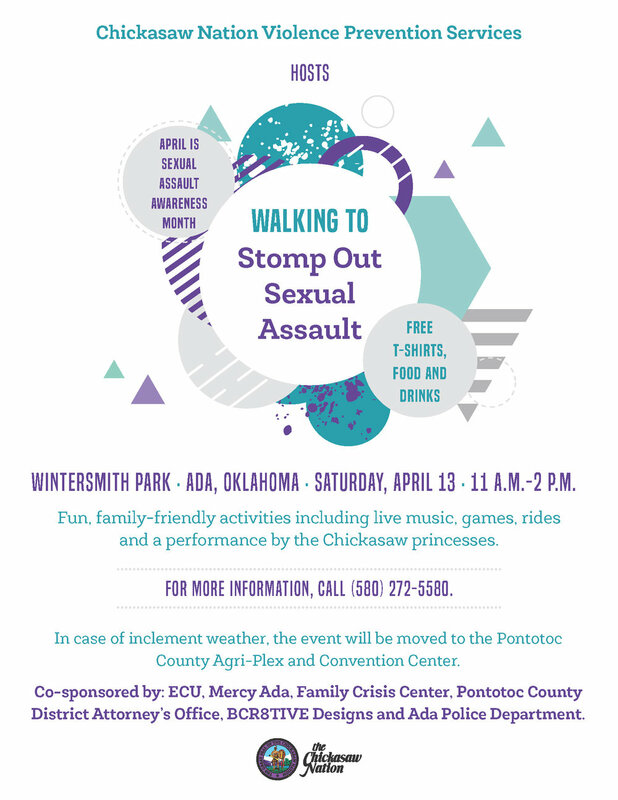 The Absentee-Shawnee Tribe Domestic Violence and Family Services invites you to participate in this fun event aimed at creating awareness for Sexual Assault Awareness Month. They will have the supplies for attendees to create a rock with a positive message and then hide them so that someone will see it unexpectedly. The Muscogee (Creek) Nation Family Violence Prevention Program is hosting an Honor Tree in honor of loved ones lost to violent crimes. This event is a part of National Crime Victims’ Rights Week. Native Hoops Basketball Tournament: Gamma Delta Pi Inc.
‼️ Deposit is due April 1, 2019. No teams may register after April 1st. With your money, please include your team name, roster, contact person with phone number and address. The Kaw Nation Family Trauma Healing Center is hosting a fun event for Teen Dating Violence Awareness Month. There will be free t-shirts, pizza, and giveaways! Kay County Youth groups are encouraged to attend. Gamma Delta Pi Alpha Chapter, along with the help of Cameron University Native American Student Association (NASA), is hosting our Second Annual Benefit Dance at the University of Oklahoma. The Wyandotte Nation Family Services Program is hosting a free event on consent in preparation for Sexual Assault Awareness Month. Wyandotte Nation Advocate, Lisa Arnold, will disscuss consent and how to end the cycle of victim blaming in tribal communities. Tribal citizen Julie West will teach attendees how to make traditional Wyandotte corn husk dolls. You must call 918-732-7979 to register for this free workshop for survivors of domestic and sexual violence. This cultural activity is hosted by the Muscogee (Creek) Nation. Supplies and lunch will be provided for all participants. There is limited space so call now to register. The Kaw Nation Family Trauma Healing Center is hosting a new Talking Circle. This program will run Friday February 1 through March 22nd. 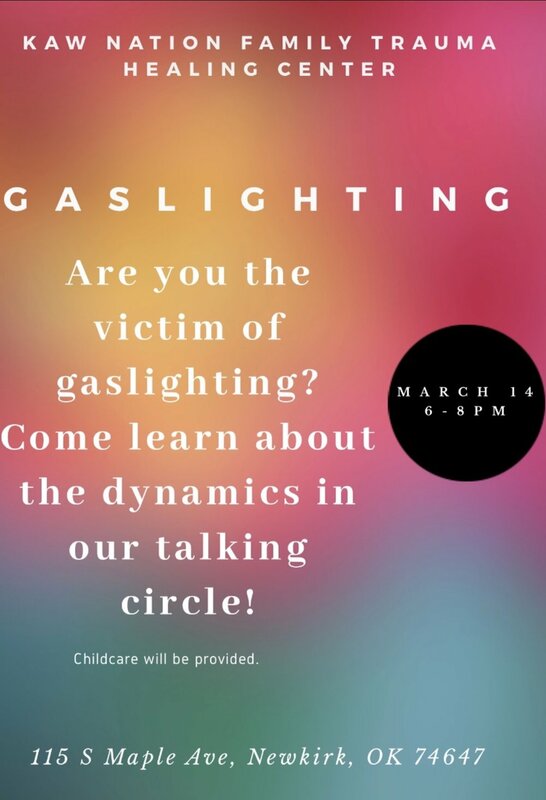 The Kaw Nation Family Trauma Healing Center is hosting a Talking Circle focused on Gaslighting. Gaslighting is a form of psychological manipulation that seeks to sow seeds of doubt in a targeted individual or in members of a targeted group, making them question their own memory, perception, and sanity. Learn about the dynamics of gaslighting in interpersonal relationships at the Kaw Nation. Lets bring everybody together to have meaningful conversations and dialogue!! All Ages are welcome to this event. 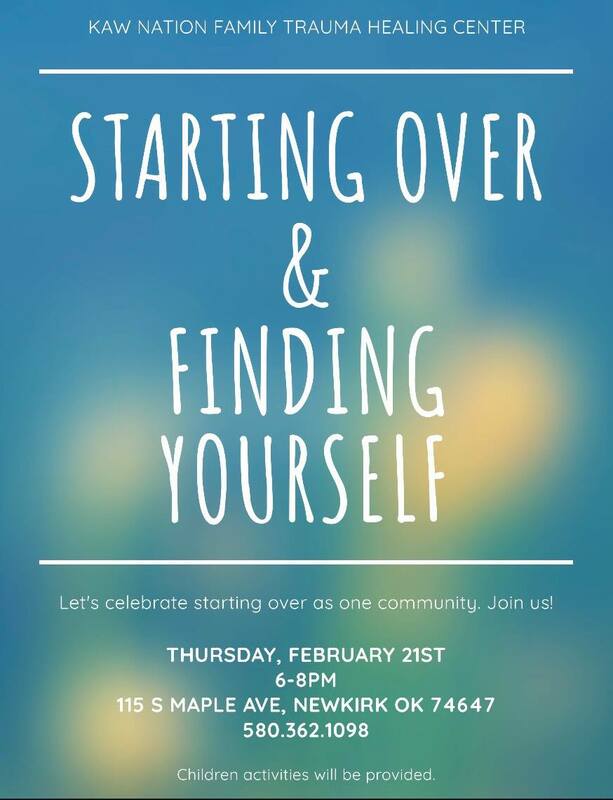 The Kaw Nation Family Trauma Healing Center is hosting a talking circle focused on “Starting Over & Finding Yourself”. The Cheyenne and Arapaho Tribes Domestic Violence Program will have a presetation on safe teen dating in honor of Teen Dating Violence Awareness Month. The presentation will take place at Canton High School. We are excited to announce that our annual Native Love event is going to be held at Skateland - Tulsa this year! All youth ages 12-18 are invited to come. We will have a photo booth, a live DJ and skating rink games with prizes for the winners. This event will be provided for youth at no charge, the entire event is free for participants. We will be providing 2 slices of pizza and 1 drink, but the concession will be open to purchase more pizza or candy. The theme this year is "Relationship Bootcamp". FVPP will use this time with participants to go over some healthy tips on how to build better relationships. And the healthy tips we will go over are reinforced on the free t-shirt the participants will receive (while supplies last)! And we will post a picture of the shirts as soon as they come in! So come on out and have fun skating with friends! we hope to see you there! *Registration and waiver are required. Both forms can be submitted online. Parent signature has to be on the waiver, unless participant is 18. Or you can fill out at the door, but parent must be present.